Is this the face only a mother could love? Lacking the flesh-piercing proboscis of a mosquito, mouthparts of crane flies are better suited for lapping-up liquids. Over the past week or two I’ve heard reports of giant mosquitoes lurking in lawns and loitering near porch lights just waiting to pounce on unsuspecting humans. These accounts remind me of younger days growing up in rural New Jersey, where I was often entertained by an old timer locally known as Farmer George. One remarkable tale expounded the miscreant deeds of “Jersey skeeters”, mosquitoes so large a couple of them could “grab you by the ears and carry you away”. Wonderful theater for a twelve-year-old kid. Is that a giant mosquito near the front door waiting to ambush me? Last week I was graced with the presence of one such dipteran monster at the picture window near my front door. Not mosquitoes at all, these large and fragile flies are rightfully known as crane flies. With long legs and delicate wings, crane flies certainly have the appearance of mosquitoes on anabolic steroids. Note the similarity of crane flies to mosquitoes such as the pale marsh mosquitoes and inland floodwater mosquitoes we’ve met in previous episodes. Little is known about the feeding habits of adult crane flies, but they surely do not bite humans or carry away youngsters. Their mouthparts are elongated and probably adapted to feeding on liquid food such as the nectar of flowers or the sweet honeydew provided by sucking insects like aphids and soft scales. A colony of spirea aphids provides a bounty of carbohydrate-rich honeydew droplets on underlying leaves. Watch as a crane fly laps up honeydew soon to be converted into energy to fuel its delicate flight. Feeding is not the most important item on the to-do list of the adult crane fly, but finding a mate is. Male crane flies are the first to emerge from their pupal cases and their first task is to search for females. After finding the fly of their dreams, the couple mates and the female deposits eggs in the appropriate habitat which, depending on the species, could be water, soil, or a rotten log. Eggs hatch into maggots that are sometimes called leatherjackets. 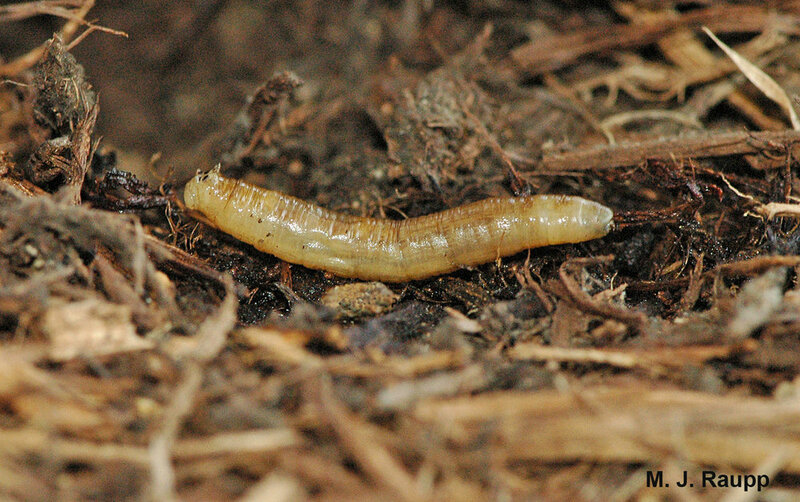 Crane fly larvae, also called leatherjackets, are often found in soil or rotting wood. Crane fly larvae eat a variety of things. Many species live in moist soil or rotting wood and eat decomposing plants and other microscopic organisms associated with organic matter. Some crane fly larvae live in water and have gills. They are predators of other small invertebrates or herbivores consuming algae and moss. Most crane fly larvae are important recyclers of organic material, but a few attack living plants and can be pests. Recently, a crane fly native to Europe was introduced to New York State where it has become an important pest of grass in lawns, parks, and golf courses. The larvae eat roots and may kill large patches of turf. In addition to their important role as recyclers, crane flies are a fine source of food for many nesting birds at this time of year. So, on these occasional warm fall evenings when you return to your home and see those large crane flies around your porch lamp, you may want to dispel the fears of the youngsters and tell them all the good things crane flies do - or you could tell them about Jersey skeeters. “An Introduction to the Study of Insects” by Borer, DeLong, and Tripplehorn was used as a reference for this episode.